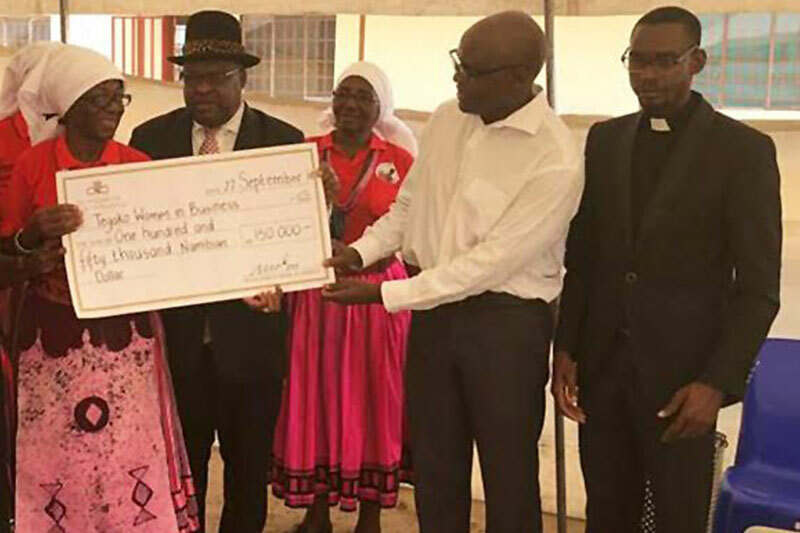 Development Bank of Namibia (DBN) CEO Martin Inkumbi recently donated on behalf of the Bank N$150,000 for construction of a dam for the Tegako 2020 Women in Business Co-operative. Tegako will use the dam for tilapia farming, as well as for irrigation of an orchard of 500 trees and vegetable plots. Tegako 2020 Women in Business Co-operative is a group of visionary women from Olulongo in the Oshana Region. The Co-operative, which benefits widows, pensioners, orphans, those living with HIV and aids and others, engages primarily in traditional income-generating activities, of which tilapia aquaculture is one. Martin Inkumbi said the Bank elected to finance the dam as DBN sees it as having good potential to uplift the livelihood of this group of rural women, their families and the surrounding community. He said that the dam will provide food security to members of the Tegako Co-operative, and hoped that tilapia catches would be productive enough to also provide an income to Tegako, and make the Co-operative self-sustaining. Inkumbi also linked Tegako to sustainable agricultural practices. He said that the agricultural industry is vital to reduce rural poverty. Rural poverty leads to urban migration, which in turn leads to urban poverty. By promoting prosperity in rural areas and smaller centres the Bank strives to balance socio-economic wellbeing across the regions of Namibia. Talking about the significance of dams, Inkumbi said that water storage represents a current resource for the economy but is also critical for providing a buffer against drought. The further value of dams lies in catering to the water requirements of future generations. In light of this, Inkumbi said, the Bank makes available finance for water storage infrastructure, such as dams and reservoirs, as well as water distribution infrastructure. Noting that the Co-operative was established and is managed by women, he said DBN seeks to transform economic participation in favour of women. The Bank is well aware of the critical role of women in providing for their families and the benefits they bring to communities. The Bank recognises that by providing finance for women entrepreneurs, it will strengthen their opportunities to spread the benefits of their incomes and give them the ability to create opportunities for other Namibians. Inkumbi concluded by noting that the project fulfils four of the Bank’s six pillars of corporate social investment. The project, he said provides an exemplary means of poverty alleviation but also skills development, community health and environmental benefits. The Bank also provides funding for educational initiatives and improvement of the broader business environment.